Kentucky is the center of the American bourbon industry, and of American bourbon exports. While bourbon production has expanded well beyond the borders of Kentucky in the last two decades, the Bluegrass State remains the symbolic home of the liquor. Kentucky is also one of President Donald Trump’s strongest states. Trump won Kentucky by nearly 30 points in the 2016 election, and net approval of Trump in Kentucky remains positive. 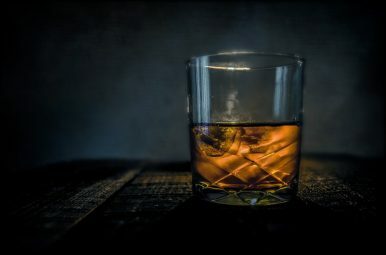 In part because of strong popular support for Trump, the bourbon industry has remained reticent about directly critiquing the president’s trade policies, or taking public stances on the trade war. Indeed, several bourbon industry employees referred to official prohibitions against speaking to journalists about the impact of the trade war on the business. Kentucky produces 95 percent of the world’s bourbon supply. The state has 68 distilleries in 32 counties, an increase of 250 percent over 2009. Overall, the industry is worth $8.6 billion, and directly employs over 20,000 people in the state; downstream jobs are significantly higher. Most Kentucky bourbon is produced from corn grown in the state. Until 2016, the industry expected growth in revenue, jobs, and capital improvements to continue. Since 2013, bourbon production has increased by 115 percent. The state itself has become steadily more dependent on tax revenue from the industry. Bourbon exports have tripled over the past two decades, to a total of $450 million in 2017. But Trump’s trade war is undoubtedly increasing uncertainty. As a report from Blacksummit Financial group indicated, the tariffs themselves have more of an impact on small producers because they cannot take advantage of economies of scale to reduce transportation and warehousing costs. Moreover, while big producers can experiment with ways to avoid tariffs (warehousing in a third country, for example), small producers don’t have the resources to employ such strategies. Finally, while all producers have been hit by second order effects (an increase in the price of steel and aluminum because of tariffs) startups and small distilleries looking to expand obviously have the biggest problems. Moreover, as Bourbon Banter senior contributor Erin Petrey points out, Kentucky distilleries have increasingly depended upon tourism as a substantial portion of their revenue. This includes distillery tours (along the Bourbon Trail), gift shop purchases, and the like. Reportedly, the Kentucky Bourbon Trail attracted some 1.4 million visits in 2018, 70 percent from out of state. If foreign buyers have less experience of a diverse world of bourbon, tourist dollars in Kentucky could grow thin. This hits small distilleries more heavily than large, although the big players also earn substantial revenue from tourism. The bourbon wars hold important lessons for how Americans think about trade policy. Trade wars have an impact even on inland states, and even on states that heavily supported (and continue to support) Trump. Within these states, the impact is not limited to urban areas, but extends to the small rural communities that gave Trump his strongest support. Most Americans don’t understand the impacts of trade, in part because such impacts are hard to define and describe. But it behooves America’s political representatives to do a better job of coming to grips with the real effect of trade on communities in the United States.